As Lady Pamela Holland in BBC’s ‘Upstairs Downstairs’; a role created by screenwriter Heidi Thomas (Call the Midwife, Cranford) to illustrate the 1930s attitudes to disabilities. 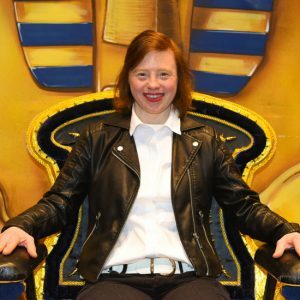 Sarah also starred in an episode in series 3 of Call the Midwife highlighting the treatment of people with physical and learning difﬁculties in 1950s Britain. More recently, Sarah played the role of the Quines’ daughter Dodo in the BBC/HBO 2-part adaptation of Robert Galbraith’s Strike, The Silkworm, prompting a tweet from J K Rowling praising her immense talent. She is also a familiar face on CBeebies Bedtime Stories with her readings of ‘We’re Not Sleepy’ and Eric Carle’s ‘The Very Busy Spider’. Storme appeared in a Malteser advert highlighting the lighter moments in the lives of those living with a disability. As Storme says: “The arts have always played a big part in my life and I’m passionate about breaking down barriers to accessing them. 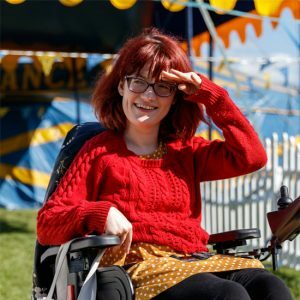 It’s an honour to be asked to be a patron of an organisation that has pioneered inclusive shows for 30 years inspiring families who might otherwise ﬁnd it difﬁcult to experience the joys of live performance.” Storme has cerebral palsy and uses a wheelchair. Storme is currently studying to pursue a career in teaching.